I have to say thank you for giving my younger two boys a bit of educational entertainment this evening. I called them in to help me count the “votes” to determine which Whole Wheat Quick Mix recipe I would share with you first. They made a list of the options, and then made tally marks as I called out “cookies”, “fruit pizza”, “pancakes”, etc. You know boys. Everything is a competition. As we went through each of your comments, the excitement grew. Who knew that counting recipe votes would be so much fun? At one point early on, Malachi shouted, “Muffins are in the lead! !” And so it went. Ah, it’s the simple things in life that are the most fun, right? Mix all ingredients together. Scoop 1 ½ teaspoons of dough onto a cookie sheet, about 3 inches apart. Bake in a 375° oven for 12-15 minutes. Makes about 2 dozen cookies. More of our new Oh, For Real recipes coming soon – in particular, recipes that use this Whole Wheat Quick Mix. I’m curious (and this has nothing to do with cookies, books, or quick mixes): Is it snowing where you are? We’re getting several inches right now. Fun! It has been sleeting for the past 3 hours! Not fun! Maybe I need to make some cookies! I am so curious about these cookies…no oil or butter? I have two dairy-free kiddos and have such a hard time finding a good cookie recipe. I am excited to try this one! If you look at the Quick Baking Mix recipe that Laura posted a few days ago, youw will see that there is Palm Shortening or butter in the recipe. You use that mix to make these cookies. The weather here is crazy. I live in South Georgia. One day it is cold as ice the next hot as fire. There is no packing up winter and summer clothes around here. Thank you so much for you handy recipes. I am on the road to healthy eating and getting my family aboard has been easier than I thought. So very interesting… I have just recently started reading about these special oils. However being on a very limited budget makes purchasing them a challenge and knowing which brand to trust is another problem. Thank you for all the info you make available to your readers. Would love to win! This morning it is 50 degrees here in middle Tennessee, but it is supposed to reach around 64 degrees today. It has been cold one day and warm the next day here for the last few weeks. We would love to have some snow but will take whatever the Lord sends our way. Can’t wait to try these cookies!!! We had snow but typically it is already gone. This recipe would be a great place to use “vanilla sugar” made with the beans after making homemade vanilla. We were very lucky – most of the storm missed us – we only got about 8 inches. Still, school got out early yesterday and was just cancelled for today. Guess we’ll spend the day digging out ourselves and our elderly neighbor lady. Would love to win the lemon essential oil. We do use several essential oils. One of our favorites for any itchy issues is Texas Cedarwood. We use it on our pets as well as ourselves. Just mix about 10 drops in a spray bottle with pure water and use on any itchy spot. I, like you, am just beginning to delve into the doterra oils, so far we are using On Guard, but would love to try the Lemon oil. Looks like we got another 6 inches so far last night, and more coming today in central Wisconsin. My husband plows the roads so he was gone most of the night again. Those cookies look so good. I am going to try them this weekend. Made the baking mix yesterday in anticipation of the recipes to follow. I am baking the first batch of cookies right now to share with my co-workers. It is cold here in north central Texas, but no snow. And…I love essential oils! Atlanta, GA…. Snow?? what’s that? We haven’t seen snow for the past two years, much to my 5 year old’s dismay. We got a dusting of snow, with a little ice, in south central Indiana. Thanks for the quick mix recipe! It snowed about 4 ” last night and I think the kids will appreciate some comfort food-chicken pot pie after they play in the snow later today. The quick mix will make the biscuit topped pot pie really easy. I’m going to try it today, hooray! I wish! No snow last year either. Poor kiddos. But once a year is about all I care for so I think I live in Paradise, aka Athens, GA! We just dug our way out of 11 inches of snow! And, more is on the way Sunday night! ARGH!!! 27 degrees and snowing up a storm. 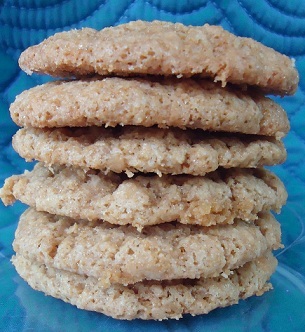 I just mixed up the “quick mix” and made the cookies, but at 1 1/2 TEAspoons the cookies were charred at 12 minutes. I tried the next round making 1 1/2 TABLEspoon sized cookies and they were done in 8 minutes. I tossed in some chocolate chips for kicks and am about to put the last of the dough in the oven. We got about 4 inches last night and it is lightly snowing now, love the midwest, Wisconsin to be exact. The cookies look great. We even got snow here in Tucson, AZ two days ago! Amazing!!! I am so eager to make these cookies! I whipped up my quick mix this morning and have it stowed in the freezer. I chose to use soft wheat instead of hard (remembering to pack it down in the cup) and found that an empty palm shortening tub worked beautifully for storage. As for weather…we don’t get much snow in south Alabama :( . We are getting MUCH rain though – after much last week. This is very unusual for us. We are predicted to get up to 10 inches. We are thankful though because we suffer with dry conditions so many years. 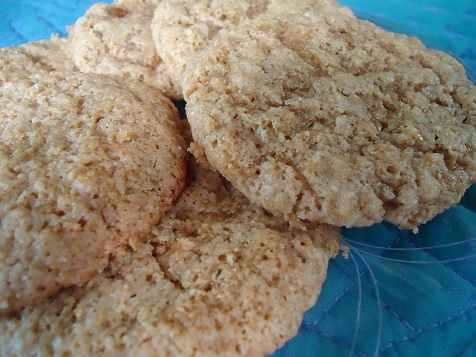 Just made these cookies….my 7 year old just exclaimed ” These are AWESOME!” While giving the thumbs up. Thanks for the recipe ! In Minnesota, we had several inches of snow. Because we are hardy Minnesotans, we just went about our normal day! Made the cookies last night, added almond extract and chocolate chips, yum!! Going to make the pancakes now! Thanks for these recipes, they are awesome! Ok, what did I do wrong? I used coconut oil to make the mix instead of the palm shortening and when I tried to make the cookies first they completely stuck to the pan, there was no way I could get them off without destroying them. Then as they cooked they spread out so they were all touching and were very thing which happens to my chocolate chip cookies when I don’t use enough flour. So is that it, did I just need to add some more flour to my mix? Uh-oh, I don’t know what might have gone wrong. I’m not sure about adding more flour to your mix – but if you mix up the cookies and find that it is too liquidy, go ahead and add extra flour to the bowl or add a little extra quick mix to thicken up the batter. Hope that helps! I made these last night, and the taste was great! BUT after they cooled they were hard as rocks! What did I do wrong? I didn’t burn them I just watched until they were a light golden brown like I thought I was suppose to with cookies…hmmm The taste is really really good I want to figure out what I did wrong! Uh-oh, not sure what might have happened. Glad they at least tasted good! I learned this trick from my mom. If you ever have cookies that are too crunchy for your liking all you have to do is put a slice of bread in the bag/container with the cookies and the moisture will leave the bread and make the cookies softer. I’ll try that next time! Thanks! I made these cookies today and loved them! Very easy and tasty! I had a question. I live in Jordan and can’t seem to find sucanat sugar, so I’m using Hain All natural turbinado sugar(which im using at the moment), I also found organic brown sugar here, which one is a better substitute?? i’m sure both are better than white sugar :) plus can’t find freshly ground wheat here, so im using bob miller’s whole wheat. what do you think about that? Either one of those sugars is fine! Bob Miller’s is Great too! Good for you! Cannot thank you enough Laura for the quick mix recipe!!!! Love from TN!